During the fall, I often find myself running through forests, hiking up and down trails, driving along country back roads, searching for wildlife, and exploring new lakes and rivers and snapping dozens of photos of anything that catches my eye along the way. This painting is inspired by all those adventures and snapshots. Painting is all about how an artist uses light and composition to set a mood. 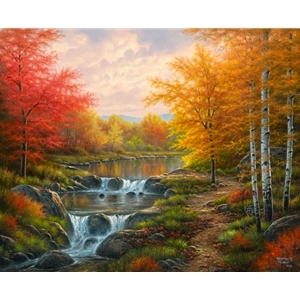 Ive designed this image to welcome you into the painting by leading your eye down the path, to enjoy the golden sunlight and the rushing brook. I hope this piece welcomes you and blesses you with the beauty of Gods creation!